Turkish Prime Minister Recep Tayyip Erdogan faced calls to ease curbs on free speech and let judges operate independently in order to breathe fresh life into the country’s languishing bid to join the European Union. Long stalled by Europe’s economic troubles and waning appetite to take in new members, Turkey’s application is now hung up on the perception that Erdogan has strayed from the promotion of western-style liberties and pluralism during more than a decade in power. “You can say sparks flew,” European Parliament President Martin Schulz told reporters after an “animated” closed-door meeting in Brussels yesterday in which European lawmakers accused Erdogan of shunting aside impartial judges and stifling free speech. Erdogan drew European condemnations in June for a crackdown on peaceful protesters in Istanbul’s Gezi Park and in December for dismissing police chiefs and prosecutors in response to a corruption investigation that led to the arrests of three sons of cabinet ministers and the chief executive officer of a state-owned bank. The unfolding graft probe has exposed a power struggle between Erdogan and followers of a onetime ally, Islamic cleric Fethullah Gulen, now living in Pennsylvania. Concerns about the reliability of Turkey’s governing system have rattled markets, making Turkey’s currency the world’s worst performer in the past month. Erdogan responded by proposing a law to restructure the board that appoints judges. Opponents in parliament accused the premier of trying to blunt the corruption inquiry and give his Justice and Development Party control over the judiciary. As Erdogan concluded his Brussels meetings, NTV reported that the judges board had removed 97 judges and prosecutors. About 2,000 police officers have also been shifted from their posts. Cheering Turks living in Brussels greeted Erdogan at his hotel on Monday night, on his first trip to EU headquarters in five years. European officials who met him yesterday admonished that democracy isn’t only about winning elections. Turkey’s effort to join the EU has stagnated since it started in October 2005. Turkey has made it 1/35th of the way through a checklist of legislative and policy moves required for membership. The process was on hold for three years until resuming last November. Originally slated for June, the restart of the talks was delayed by Erdogan’s handling of the Istanbul protests. Germany, then heading to its own national elections, objected to making an EU concession to Turkey when the nightly news showed police snuffing out anti-Erdogan rallies. No EU official gave a date for the next step in the entry negotiations. 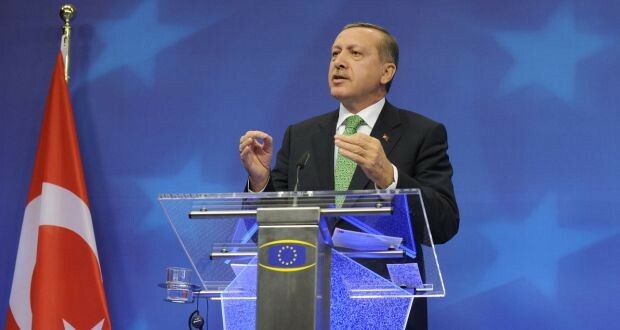 Erdogan voiced confidence that Turkey is on the verge of advancing on “a series” of EU policy fronts. EU rules require a unanimous 28-nation vote either to move ahead with the membership talks or to halt them for good. The limbo allows some EU leaders to say the door is open to Turkey and others to insist that Turkey won’t walk through it anytime soon. Erdogan said that rejection by the EU might push Turkey in “other directions,” potentially toward the Shanghai Cooperation Organization, an economic alliance linking Russia, China and four central Asian countries. European attitudes have swung against further enlargement, with even Britain, a champion of the 2004 expansion to eastern Europe, now demanding curbs on migration from poorer countries. Some 52 percent within the bloc opposed further expansion in November, compared to 49 percent in favor when Turkey’s talks started, according to a regular EU poll. Erdogan’s treatment of opponents has unsettled the European Parliament. Marietje Schaake, a member of the Parliament’s Liberal faction, accused Erdogan of suppressing freedom of speech and called for an international investigation into the ruling party’s alleged interference with the judiciary. “The problems are now so immense that they need to be investigated independently,” Schaake said in a statement before Erdogan’s visit. While the EU Parliament has little power over the entry process, it serves as a barometer of European public opinion. Erdogan got a taste of that opinion in the late afternoon meeting with key members of the Parliament that ran 45 minutes over time. He called it an “exciting, productive” session. Schulz, the assembly’s president, said he differed with Erdogan on many points while praising him for answering questions more patiently than elected EU leaders. Turkish businesses have also objected to a proposed law that would give the government more power to shut down websites, saying it would amount to censorship. The EU’s commissioner for web policy, Neelie Kroes, told Erdogan in a Twitter post that it’s “time to live up to that promise” of an open Internet. Turkey argues that its economic progress makes it a worthy addition to the EU. Gross domestic product per capita has risen from 36 percent of the EU average when Erdogan took office in 2013 to 54 percent in 2012, making Turkey more productive than bloc members Bulgaria and Romania. “We don’t want to be a burden for the EU, we want to be an engine for the EU,” Erdogan said.